Wow, after the way “spring” started, I didn’t think we’d see this weather any time soon. We did kind of jump right to summer, a little. But it’s not stupid hot or anything, so it’s good. The Forsythia is in full bloom and the Lilacs will soon be out. “Blossom Sunday” is upon us here in Niagara; a time when historically tourists would come from far and wide to ogle the orchards in full bloom. That doesn’t happen so much anymore, at least not organized tours, but we’re planning on going out to take in the beauty. If I get some good pics, maybe I’ll come back and add them. Or check out my instagram account. It’s been quite a week. I’ll spare you any details of the stomach bug that made its way through Little Miss, only to infect me once she was all clear. Plans to finally lay the kitchen floor got set aside, and I my diet was mostly some Pepto Bismol and Gatorade. But once I was feeling better, I went with my gut, so to speak. We had steak and garlic bread and a fresh green salad for dinner. And dessert was a nod to the coming berry season. 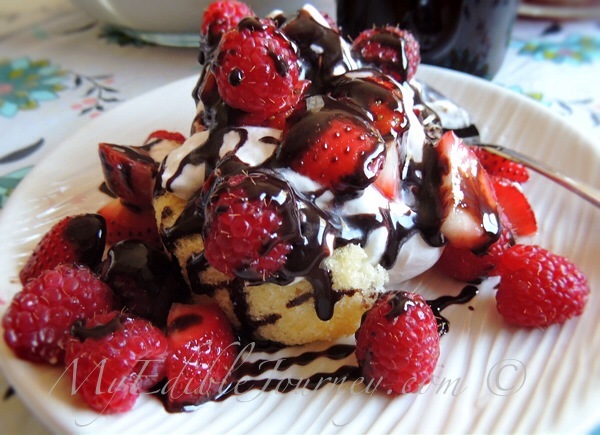 Shortcakes with strawberries, raspberries, cream whipped with Greek yogurt and homemade chocolate sauce. 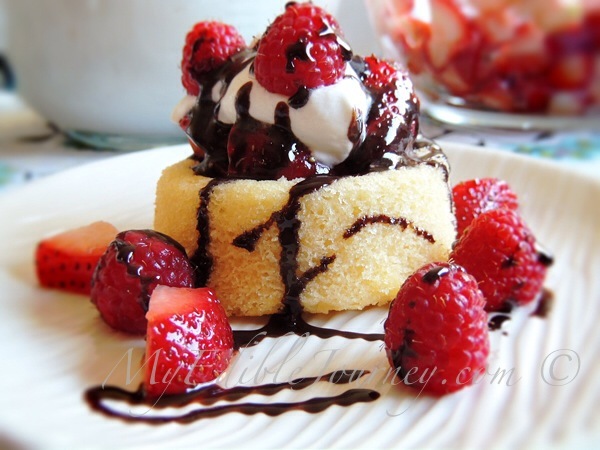 The shortcakes are easy. I buy pre-made sponges. Yes, I know there’s debate about which is best, sponge cakes or more scone-like biscuits. I grew up eating the sponges and am still partial to them. The whipped cream was just a cup of cream that I whipped up with some sugar, vanilla and a dollop of Greek yogurt. I find that it holds up well, and the tang is really nice. I chopped the strawberries and tossed them with a little dark brown sugar, and left the raspberries well enough alone. The sauce I already had in the fridge. 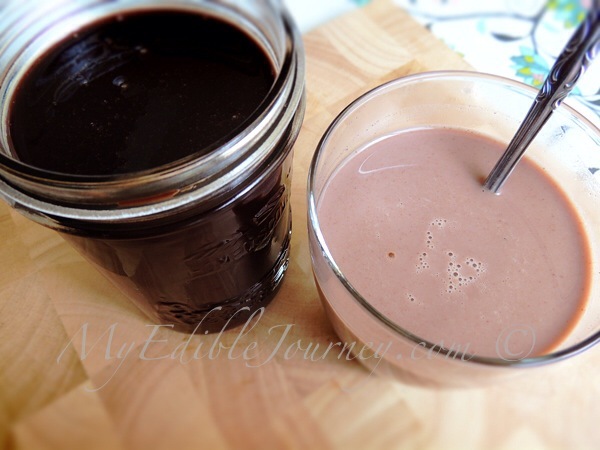 It’s also super simple, and can be stirred into chocolate milk or a latte, for a nice treat. In a medium saucepan, add sugars, cocoa, corn starch and salt. Whisk together gently. Gradually add the water, whisking to smooth out any large lumps of brown sugar. The rest will melt, so don’t worry. Add the chocolate chips, if using. Bring mixture to a boil over medium-high heat, stirring occasionally. Reduce heat and cook for about a minute. It’s not fudge sauce, so it won’t thicken significantly. Remove from the heat and add vanilla. Cool and store in in an airtight container in the refrigerator. While the above pictures are nice and make for good blog photos, the reality is that THIS is the portion of berries, cream & chocolate I enjoyed. Not as pretty, but honest. 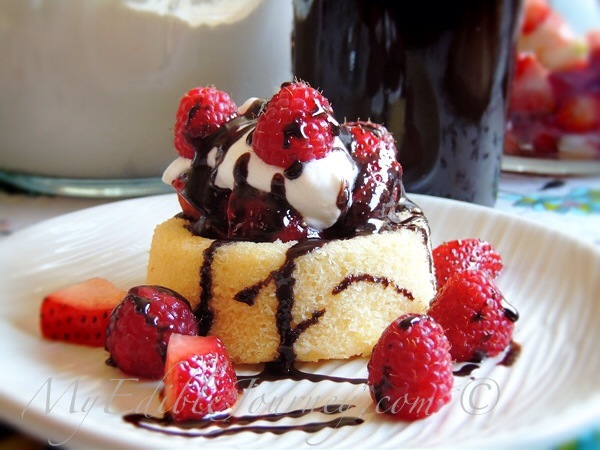 This entry was posted in Chocolate, Desserts, Fruit and tagged chocolate, cream, raspberry, shortcake, strawberry, yogurt on May 4, 2013 by Mama B. That looks so incredible. Like a bite of summer sunshine. I cannot wait to make it! LOL, blog pic portions are always so… dainty. Reality isn’t often as photogenic.